You are here: Home / Blog / Uncategorized / Summertime, summertime! For many of us, summertime is a magical period full of joy and beautiful moments. We spent time with our family and friends and enjoy the warm sun’s rays outside. We just feel great! While the sun’s rays positively influence our mood as they stimulate the production of endorphins (“feel good” hormones) they do not always positively impact our skin health. On the contrary, they can cause severe skin damage! For you to fully enjoy the summer without worrying about your sensitive skin, we prepared a few summer skincare tips! We asked our skincare expert, Cecilia Weidner, to tell us what the best beauty regime for healthy summer skin is and share some crucial facts about the sun’s impact on our skin. It is very important to know that a sun protection cream should be effective in shielding the skin from the harmful effects of UV rays – both UVA and UVB. UV (ultraviolet radiation) is invisible rays which come from the sun. Ultraviolet A (UVA) and ultraviolet B (UVB) are two types of rays, which can burn the skin, and cause skin cancer. UVA has a longer wavelength than UVB and is responsible for aging of the skin’s structures as well as turning melanin (the pigment responsible for the color of skin, hair, and eyes) brown from its original pink color. UVB (shortwave sun rays) stimulates the melanocytes (special skin’s cells) to produce melanin. When we expose our skin to UVB, the melanin production is triggered and we get a suntan. Unfortunately, it means that damage has occurred in our skin. Pigmentation and premature skin aging are the results of such an incident of unprotected exposure to UVB. Melanin, apart from being a pigment which produces different colors in skin and hair is also responsible for protecting the skin against UV damage. It serves as a physical barrier that scatters UV, and as an absorbent filter that reduces the penetration of UV through the epidermis. Eumelanin – yellow to brown to very dark brown (almost black) color; seen in brown-black hair. Pheomelanin – red-yellow color; seen in red hair. The amount of each type of melanin partly determines your skin and hair color. Melanin is produced by melanocytes located in the basal layer of the epidermis (the outer layer of the skin). These melanocytes have octopus-like tentacles (dendrites) which carry melanin to nearby skin cells (keratinocytes) when they are needed (i.e. when skin is exposed to the sun’s damaging UV rays). The melanin that is deposited in the skin cells serves to protect the DNA. If your skin tans, it is a sign that the skin’s DNA experienced damage. Melanocytes and melanin play a crucial role in protecting our skin against the harmful influence of the sun’s rays. Although melanin is the body’s first line of defense against getting sunburn, it is essential to use sun protection cream with filters to make sure there is no more severe damage to our skin. 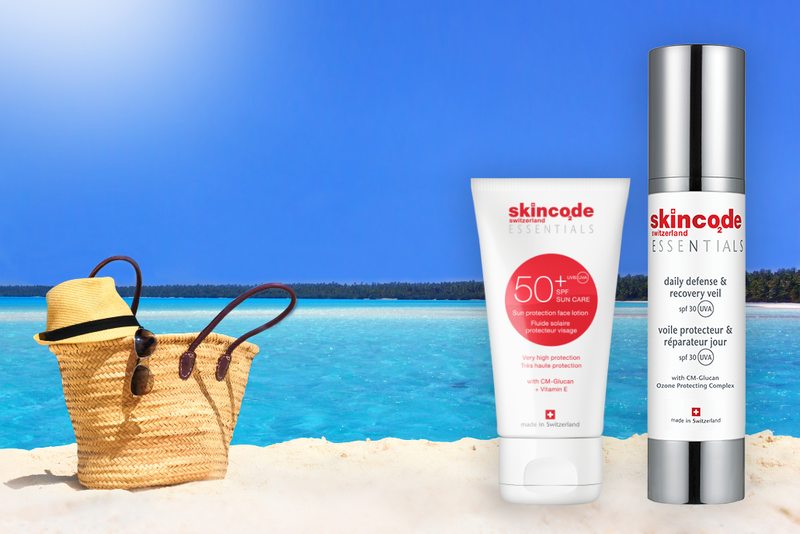 Skincode has the answer to protecting your skin against both UVA and UVB radiation. With its unique Skincode Essentials product line, it fully shields your skin against external, environmental stressors. The line includes moisturizers, suitable even for the most sensitive skin, with sun protection factors ranging from 10 to as high as 50. 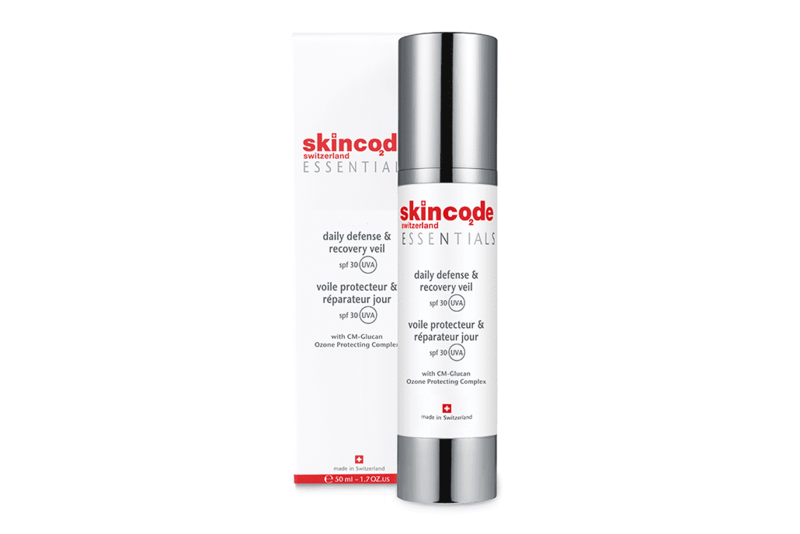 For example, the Skincode Essentials daily defence & recovery veil spf 30, has a sun protection factor of 30. In addition to the fact that it is effective in protecting against both UVA and UVB, it also contains a protecting complex to shield the skin from the harmful effects of ozone pollution. On top of that, it prevents any oxidants from attaching to the skin and effectively prevents pigmentation while moisturizing and soothing the skin. 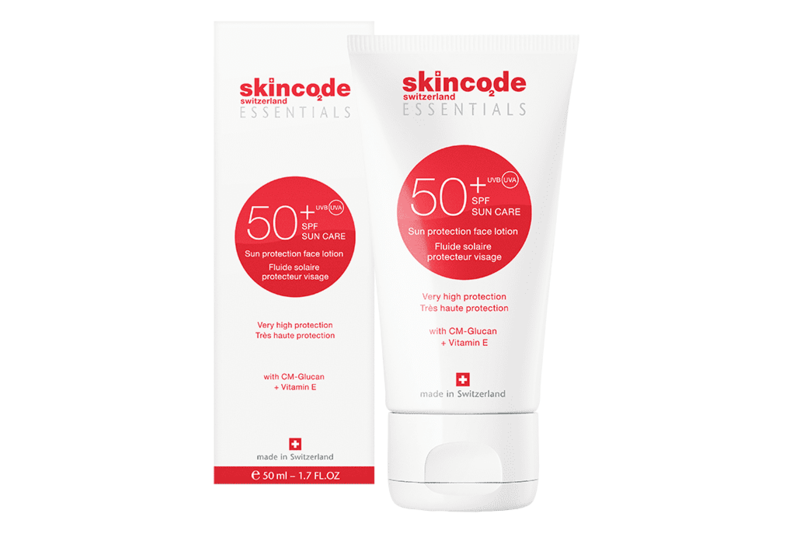 The Skincode Essentials sun protection face lotion spf 50 + offers a broad spectrum UVA/UVB protection to shield the skin from UV radiations and prevent cutaneous damages. It protects against oxidative stress, skin irritations, and sunburn as it stimulates the skin’s self-protection and repair mechanism. It also helps to keep the skin hydrated and smooth. Now let us look at the skin care principles to follow to ensure a blooming complexion throughout summertime. Here are the 4 steps to ensure the healthiest, beautiful skin during the sunny period. Cleanse and tone your skin twice per day. Cleansing removes excess oil and impurities from your skin and helps improve its health and radiance. Toning is also an essential part of any beauty routine because it helps to re-establish the healthy pH-value of the epidermis and ensures that the skin is completely clean, so you derive the maximum benefit from the products you apply afterward. Treat yourself to a peaceful spa routine twice to three times per week by doing exfoliation followed by a suitable mask for your skin type. To learn more about exfoliation and “multimasking,” we encourage you to read our spring skincare blog post which you can find here: http://bit.ly/2pasYBK. Apply a suitable serum to the face and neck area. Serums can contain up to 70% more active ingredients than creams. They are not intended to be used on their own, but rather always in combination with a cream (either day or night cream). These two products combined ensure that your skin will be optimally exquisite throughout summer and long afterward. This step should be repeated twice per day – every morning and every night. Note: after applying your face serum in the mornings, apply a suitable day cream with a sun protection factor. Apply a serum to the delicate skin around the eyes, followed by an eye cream. It will ensure the delay of the onset of crow’s feet around the eye area. To have flawless skin around the eyes, repeat this step twice per day. The above skincare regime will ensure that your skin is fully protected against the extrinsic factors of aging. However, it is important to remember that we also need to take care of our skin from the inside. During hot, sunny days, it is essential to drink at least two liters of water daily to compensate the water loss through our skin (called Trans Epidermal Water Loss (TEWL). Summer is a season where extreme environmental factors prevail: the sun can take a toll on your skin. However, you do not need to stay at home to avoid dangers lurking for your skin. Instead, Enjoy! Apply the 4 skincare summer tips we prepared with Cecilia, to have a healthy, glorious skin. Your skin changes with the seasons and your skincare should too. https://skincode.com/wp-content/uploads/2017/06/sun1-pic-1.png 687 1030 Skincode Switzerland /wp-content/uploads/2016/02/[email protected] Skincode Switzerland2017-06-27 14:47:412017-10-10 15:26:10Summertime, summertime! 4 ways to revitalize your skin this spring Meet the new baby on the skincare block!